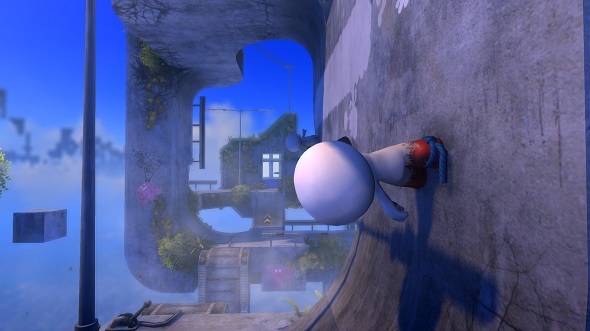 Free games: Win a Steam key for world-bending puzzle game Youropa! If you could have any superpower what would you choose? Invisibility is a good one. A lot of people go for the ability to fly, too. But how about this one: being able to walk on walls and ceilings, as well as floors? That is what the You (short for Youropean) in Youropa wakes up one day to find themsevles gifted with. Turns out, though, it’s not so much a superpower as much as it is a biological quirk – they have suction cups instead of feet. If you’re after more freebies then here are some of the best free PC games. Not only that, this You wakes up inside a tree, bizarrely, and in a world that they don’t know much about. So you have to help them use their unique ability to bend the rules as they navigate the 3D space around them, twisting their view as they go – get ready to get used to turning your head in front of the screen as you play this puzzle game. As Youropa is out next month, the developers are looking for people to help them test the game and offer feedback so they can improve it. To that end there is a beta so you can have a crack at the game and see what it’s all about. Not only does it come with the puzzling world the developers have built it also has a level editor so you can build your own cities, levels, and characters. Should be fun to construct your own 3D spaces and then hop in as you’re You, going upside down and walking all over the walls. We’re giving away 20 Steam keys that give you access to the Youropa beta and that will also bag you the finished game when it’s released in June. If you want to win one of them then you need to enter the competition via the widget below. Every action you complete is worth one entry into the giveaway with the more actions you complete increasing your chanes of winning. We’ll also need your email address so we can send you a code upon winning – we won’t send you spam, we promise. Please read ourterms and conditionsbefore you enter. While you’re here, give us a Like over on thePCGamesN Facebook page, orfollow us on Twitter, and we’ll keep you up to date on all our future giveaways.